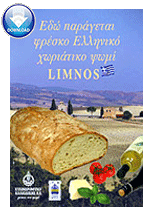 Create traditional country style bake goods of high quality, made from the excellence of Chalkidiki Flour Mills SA. The high specificity of our meal and the constant quality controls guarantee uniquely flavored breads. Coarse yellow flour obtained from milling 100% first quality durum wheat. Special mixture to produce a natural golden luxury village bread. Derived from 100% vitrious durum wheat corn with high protein. For rustic style sourdough bread. Derived from 100% vitrious durum wheat.